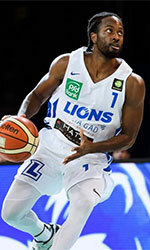 Bristol Academy Flyers (BBL) confirmed in their roster 30-year old Greek-Congolese guard Panagiotis Mayindombe (191-88). He played there last season. In 24 BBL games he recorded 3.0ppg, 1.7rpg and 1.7apg. Mayindombe helped them to make it to the semifinals. The list of the past achievements is quite long as among others he was voted Eurobasket.com All-Greek B League Honorable Mention back in 2010. Mayindombe has played previously professionally also in Greece (Esperos Patras, Koroivos, Doukas, Filathlitikos and Arkadikos). Panos is a talented combo guard who learn all the secrets of basketball in the Green academies of Panathinaikos. He has great basketball skills in all the aspects. He has a body which helps him a lot in all both positions 1-2. He is very smart player with very high Basketball IQ. Very strong first step and has very good penetration. He can organize his team with a lot of success and quality as many times he plays at the point guard position with his very good skills in dribbling and successful use of both hands. Panos has great vision of the court and helps him a lot in assisting his team-mates for the easier basket. He is stubborn and persistence player and can really do the dirty job in the court with very positive results. He can score, organize, and play really good defense. He will definitely play for the bigger league upon time comes.